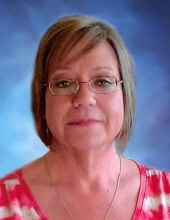 Janet E. Riley, 51, of Batavia, Ohio died unexpectedly of natural causes on March 20, 2019. She was born July 5, 1967 in New Castle, Indiana to the late Robert E. Flannery and Linda S. Moore, née Leo, who survives in Mansfield, Ohio. Janet graduated from Connersville (Ind.) High School and worked for The Kroger Co., both in Connersville and since moving to Batavia eight years ago. Janet will be remembered for her calm, kind personality and, although a bit shy, everyone who got to know her loved her and found her easy to get along with. She was a caretaker to her Grandma Cliffie from whom Janet got her love of flowers, gardening, and canning. Janet was also an avid reader and enjoyed cooking her way through her large collection of cookbooks. Janet is survived by her mother, Linda Moore; sister, Jeanine (Randy) Snyder and children, Jonathan (Amanda) and Josh Snyder; brother, Rob Flannery and his family, Kelsee Flannery (Jackson Ziegler and their children, Cole and Lila) and Weslee (Alisha) Flannery; uncle, Lowell (Barb) Flannery; and aunt, Alma Jane (Ronnie) Padgett. Also surviving are Doug Riley and his family, Deanna Riley (children, Hailey and Gauge) and Buddy Riley (children, Rylan, Malaya, and Sylas); her stepmother, Doreen Flannery; and stepsister, Vanessa Holbert (daughter, Izabella). In addition to her father, Janet was preceded in death by her grandparents, Lowell Earl and Cliffie Flannery. Janet will be laid to rest in the Flannery family plot in South Mound Cemetery, 505 Bundy Ave., New Castle, Indiana where her graveside funeral will be held on SATURDAY, JULY 13 at 10:00 am. Memorial donations are encouraged to be made to the American Diabetes Association or American Heart Association. Wise Funeral Service in Bucyrus, Ohio assisted Janet’s family and memories and photos may be shared on her Tribute Wall. To send flowers or a remembrance gift to the family of Janet E. Riley, please visit our Tribute Store. Guaranteed delivery before Janet's graveside funeral begins. "Email Address" would like to share the life celebration of Janet E. Riley. Click on the "link" to go to share a favorite memory or leave a condolence message for the family.